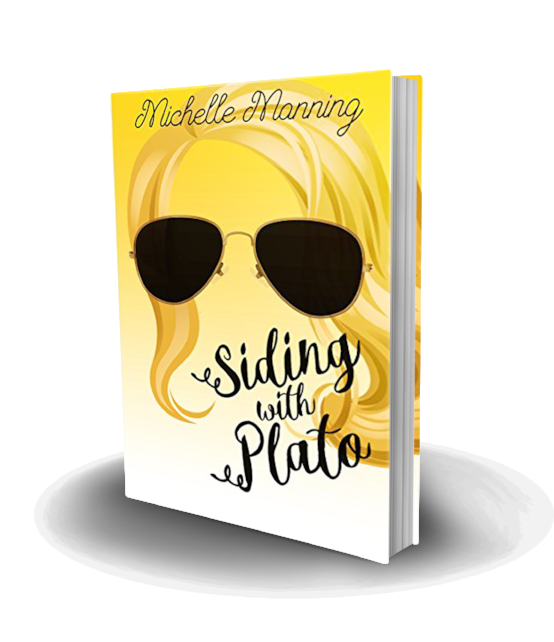 Siding With Plato is a romantic laugh-out-loud chick lit novel about being young, fun, and a seriously hot mess. Brooke Aarons can’t get to college fast enough. Leaving behind her small town life, she intends to transform herself into a brilliant psychologist at the University of Texas. Fascinated by the study of human behavior, Brooke decides to feed her curiosity when she agrees to a double date with the school’s star football player. James Cartwright's celebrity status on campus and long line of willing girls should make him a non-starter for Brooke, who is far too smart to let all his flashy attributes make her believe he's worth her time. But as his charms begin to beat her logic, she soon learns the psychology behind a bad crush is a whole lot messier of a subject. Maybe Plato was right when he said, “Love is a serious mental disease.” If so, her psych. classes better offer a solution to falling for this guy fast or she’ll be the one needing her head examined. Absolutely loved it! Its an unapologetically modern feminist coming of age story of a group of friends in college that's funny, romantic, raunchy, and all too familiar. If you've ever been a freshman woman in college then you will laugh out loud, and feel both nostalgic for those college years and happy their gone and you've learned from them. Its a Rom Com in paperback. Read if you're looking for a great way to kick off your 2016! What a fun read! It’s my first time reading anything by this author and will most definitely NOT be my last. “Siding With Plato” was super-fun, super-quirky, and laugh-out-loud hilarious! It brought me back to my college days—though, I didn’t have this much fun in my days. Brooke is amazingly well-developed and I connected to her immediately, not to mention her excitable little gaggle of friends. James, on the other hand, took a little bit of warming up to. Eventually, he proved himself to be a worthy hero and by the end, I was sold. I absolutely love Manning’s writing style; it was very easy to follow along and get sucked it. Grab this one if you want something light, fun and insanely entertaining! This book had me from the first chapter. The story of Brooke was so relate-able to me, but yet also a fantasy at the same time. Brooke's realness, along with her likable sarcasm, sense of humor and being a total klutz makes her an amazing character. Without giving away spoilers, I must say, as we follow her freshman year journey away at college in a new city brings every emotion and thought you could imagine. The group of friends she finds and the tribulation of finding love makes for the ultimate coming of age story and I loved every moment of reading it. Please make it a series! The first chapter is hilarious and from there I was hooked! I am really good at buying books but not that great at actually reading them till the end, with this book I had no problem. It's one of those books that you look forward to reading, are sad to put down and are left with an weird, empty feeling when you finish it and don't know what to do with yourself! it's now making its way round my friends, I absolutely loved this book! I love when a new author comes across my desk. Michelle Manning is that new author for January. I always start the book with a little worry about what to expect. Siding with Plato is exactly what I was hoping for and more. Wow! This was a great read with so many of my memories of college rolling back in as each page was turned. I love the main character Brooke who is clumsy, sweet, & a little bit wild. She reminded me of my first years in college where second guessing and goofy screw ups happened on a weekly basis. Michelle Manning truly has it all using her gift of humor and angst that every college girl and guy lives in their goal to get that higher education. I loved this book and read it nonstop. It was hilarious, fun, and kept me wanting to know what would happen next. Brooke's friends are the type you wish to have once you're in college. I loved how they could be themselves around each other. The pranks they pulled on the guys kept me laughing. The romance between Brooke and James stirred my curiosity. I would recommend this to a friend. Absolutely loved it! Its a Rom Com in paperback and I read the whole thing in two days. Couldn't put it down. Read if you're looking for a great way to kick off your 2016! As a recent college grad, I smiled all the way through Siding with Plato! Likable characters, relatable life situations, and a swoon worthy romance- this book had everything I was looking for in an entertaining read! I was more than pleased surprised to find out that “Siding with Plato” it’s not just an ordinary romance book, but one which comes with a fresh, lovely and modern perspective over the classic love aspects, with well-developed and captivating characters which conquered me even from the first pages! The dose of romance mixed with amusement which I found it especially in the lines between Brooke and her girlfriends, made me laugh-out-loud! But, besides that, what I most enjoyed, was the subtle psychological manner in which the author, through the protagonist, made me, as a reader, to have my own self-introspection, thing which left me with a great deal to think of, regarding this topic. I would totally recommend Michelle Manning’s book to the all the ladies who are craving for an easy-read hard to put down once started! Chicklit Central: "Siding with Plato reminded me of the 90’s teen and college drama television shows I used to watch during the glory days of my youth; very Beverly Hills, 90210..."
Review It Girl: “Siding with Plato by Michelle Manning is a must summer read. Brooke, the main female character, reminded me a lot of myself, but lived the college life I always wish I did. Therefore, I am obviously hoping for series to this character allowing me to live vicariously through her..."